There’s been a lot of hype and interest in online courses over the last couple of years, but it’s not often that people list out all of the benefits of creating one and discuss them in detail. So, In this article we’ll be asking the question: Why should I create an online course? Most people with knowledge or a skill to share can make a side income or full-time income by creating and selling online courses. An online course is a way to create a (semi) passive income for yourself and disconnect the amount of money you earn from the hours worked. It can also help to build up your authority and brand. Let’s take a look at some of the main reasons why I recommend people consider creating an online course..
Every online marketing guru seems to be promoting the importance of creating an online course right now. So do I think it makes sense for everyone to create a course of their own? No, I don't think EVERYONE should make their own online course. However, I do think a lot of people could benefit from it. If you've got any kind of knowledge or skill that people would be interested in learning, an online course could be very profitable for you. This is especially true if you already have an online audience of some kind – for example your own website, YouTube channel or Instagram following. It can also be well suited if you currently work as a consultant or coach and you want to move away from 1-on-1 work and find a way to share your knowledge with more people. If you don't already have an audience or list of clients waiting to work with you, it’s going to be much more difficult to sell your course, so you’d be best spending the time to build an audience first and then create an online course once you have that lined up. The other option if you don't already have an audience is to use an e-learning marketplace where they will market your course for you – but as I discussed in this article you should think carefully about where you create your online course because e-learning sites like Udemy take a large commission unless you do your own promotions. So, let’s assume that you do have some kind of following interested in your area of expertise or topic, what makes it such a good idea to create an online course? We've seen other online business ideas come and go, so why do I think online courses are here to stay? Below are a few of my reasons. An online course is something you can sell over and over again, without the time limitations of a regular job. Creating a course makes ‘passive income’ a reality, and breaks the link between the number of hours you work and the amount of money you earn. I put ‘passive income’ in brackets there because the truth is it’s not passive…you’ll still need to support your students, answer questions, do marketing and more…but the point is sales can come in automatically in your sleep and your time input is not directly tied to the number of sales you make. Since it's a digital product, there's no additional cost of making a new copy of your course. As long as there aren't any technical difficulties, most parts of the process are automated and don't require ongoing input from you. An online course also has pretty low costs associated with it, with high profit margins around 75% or more. And because it’s such a profitable product and scalable, an online course (or a series of courses) have the very real possibility of completely replacing your current income stream or job if you get a good marketing system in place. It’s also an asset in the sense that it has longevity – you can sell the same course for years to come. Sure, you might need to revise or update sections of it, or even the whole thing every few years. But you are making a valuable asset that will pay off over and over again. If you're coaching or working with people one on one, the number of people you can help is severely limited by the number of hours in a day. If you work 8 hours a day, 5 days a week, that's only 160 hours per month that you can potentially help people. By recording videos or making information available online, you can do the equivalent of thousands of hours of work per month without even needing to do the coaching or teaching! You basically create a digital copy of yourself and your knowledge, which enables you to reach more people than your physical self could ever dream of. People also tend to have the same frequently asked questions over and over. So instead of spending hours of your life talking about the same things, an online course can answer all of these questions helping more people with much less time and effort. Maybe you do want people to come to you for your coaching or consulting services, but you charge $300 per hour. It's hard to get a new contact to pay you those kinds of rates, especially if they’re going to need many hours of your input. An online course can be an affordable entry-level option to provide people with some of the information they need, but keep them coming to you for the most valuable answers once they're more familiar with you. You can also use your course to upsell or downsell your other services and products, or even promote other people's affiliate products. Having your own online course builds credibility and authority, and lets you create a true brand for yourself. People trust and respect those who teach others, so use that to your advantage! While your course earns you money all on its own, it also leverages other areas of your business or any new products that you plan to release in the future. By saying you have taught ‘x’ number of people all over the world, you have instant credibility enabling you to position yourself as a top expert in your field. Even if you already have a successful business, you might want to add an online course to your offering just to diversify a bit. That way you spread out your risk so you're less reliant on another area of your business, like consulting services or selling physical products. This is exactly what we have done in my mushroom growing business, where education and online courses have become a huge part of what we do alongside growing the mushrooms and making mushroom growing kits for sale. Having an online course earning you money means you can work from anywhere in the world. All you need to have is an internet connection and a laptop. You're not bound to one location like a traditional job. You can keep making and promoting your courses while you're sitting on a beach in Thailand. In fact plenty of people are doing exactly this as one the best ways to make income as a digital nomad. An online course also gives you the ability to sell to a global market and have students from countries all over the world. That's something you'd never be able to do if you were only teaching courses locally within your own city. You can create an online course with very little money or equipment needed. Check out my article on how much it costs to create an online course for more info on this. Your course will be of a higher quality if you're able to invest a bit of money for some equipment like a good microphone, lighting, camera and screen recording software. However, it’s not necessary and you could make your first course using just the webcam and microphone built into your laptop and then improve it later on once you’ve made some income from it. Compare that to a physical educational institution that needs to buy or rent classroom spaces and fill them with desks and technology and employ lots of staff. Making an online course is one of the most low-cost and low-risk businesses you could start. Even in the worst case scenario and your course never sells a single copy, you won't lose much money. Especially compared to other businesses like opening a restaurant or store where you need to pay hundreds or thousands of dollars per month to rent a space, plus pay for inventory as well. Since your product is totally digital, you also don't have to worry at all about manufacturing, shipping costs, delivery, or things regular businesses do. Every part of your business is done online including website customization, content creation, advertising, and any administration. Creating and selling online courses can enable you to live a very flexible schedule. If you want to work on it 9 to 5 you can. You can also grind for 70 hours per week if you're trying to create an online course empire for yourself and then retire (or semi-retire) early. Or you can take a more laid back approach and just work for a few hours each day or just on certain days of the week, making it perfect for stay at home parents, or just about anyone that wants to do more than work in their life! It's your business, and you can run it however you want. That leaves room for hobbies or even having another part-time job to earn a steady income during the early stages of setting your course up. 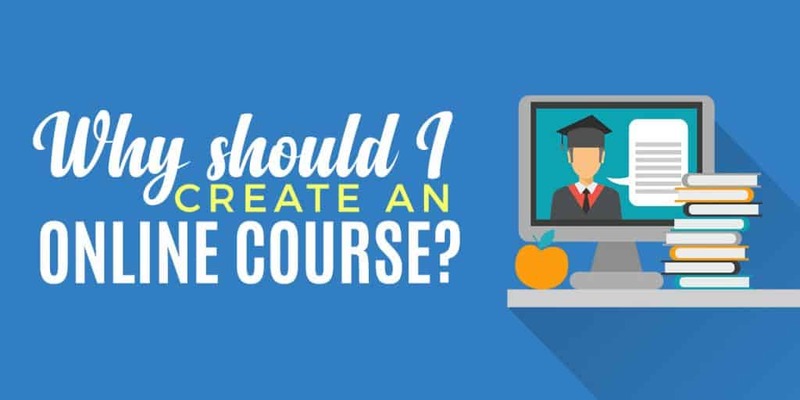 When should I create an online course? When you're having to turn down clients, it's time to create a course covering the basics to free up some of your time. Especially if you find yourself giving the same advice over and over to all of your clients. If you've got a process that works and great results to show for it, people will be eager to try it out for themselves. If you've already got a following, then you're probably already sharing a lot of value, often for free. Why not capitalize on that and sell a premium paid course? Sometimes the signs will be very clear. People will literally be banging on your front door (or email inbox) asking you to teach them more! What are some reasons not to create an online course? Online courses are not a get rich quick scheme. It can take a lot of time and work to choose your topic, create a course outline, record the course, get it set up online and then market it.. You'll have to devote many hours of your time to it, and just because you put all the effort into making a great course it doesn't necessarily mean anyone will buy it. Though if you validate your idea well at the start this shouldn't happen. If you've never made a video or a blog before or you don't have any basic knowledge of technology, creating a course on your own might be quite a challenge. It will probably be too overwhelming to figure out the basics of recording a video or writing a blog in addition to trying to set up a course – though if you have a good budget and clear demand for your teaching you can pay someone to help you do all of this. Sometimes you have a great idea that just isn't being served by the market yet. But if nobody is talking about the topic you want to make your course about, it might be due to a lack of demand. If you can't find any books, blogs, or podcasts about your topic, you might want to broaden your topic so it appeals to a more people. Making an online course takes time. It could take many months before you have created it and got it all set up to sell. If you're unemployed or thinking about quitting your job to make an online course, but you can't pay the rent, then you might want to hold off. Your time might be better spent finding a part-time job in the short term to cover your immediate monetary needs before you take a risk creating an online course.